The affects of rising damp are usually very noticeable within a property. Rising damp occurs when water from the ground rises up through bricks and mortor, usually because the property has never had a damp proofing course (DPC) fitted or because the DPC is damaged or deteriated. Tidemark and damp patches on walls up to 1 metre above floor level. Wallpaper peeling away from the wall. White salty deposits on the plaster or brickwork. Skirting boards damaged from water ingress. To remedy the problem the first thing to assess is why the moisture is bridging the damp proof course (DPC), it could something as simple as soil piled up against a wall or recent paving that was installed too high or it could be that a building doesn't have a damp proof course (DPC) or the DPC has deteriated and is allowing moisture ingress. If the damp proof course has failed, we can inject cream into the walls to create a water barrier, remove any affected plaster work and replace with a plastic tanking membrane system before replastering. Tanking is a term used in the trade to fit a plastic membrane that is a barrier to moisture and allows air to circulate around it thus making conditions difficult for further moisture problems. Replacement of timber may also be required. Rising damp showing tide mark. 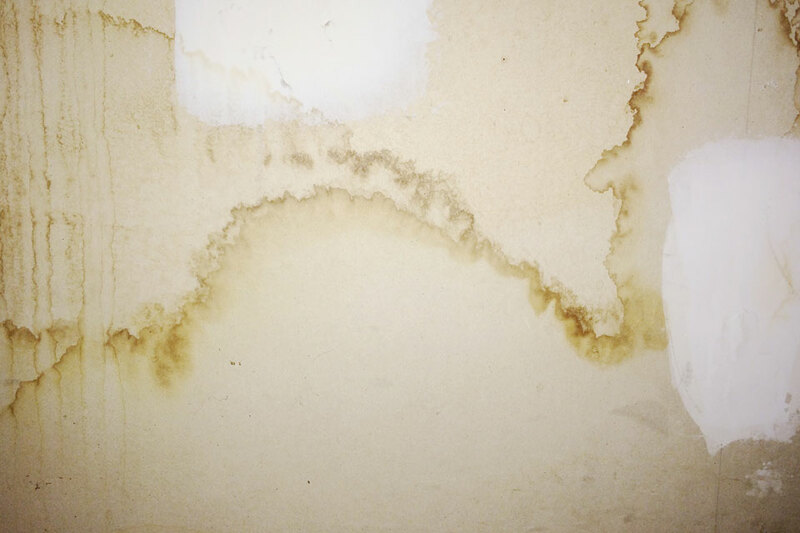 Penetrating damp often occurs in areas where there is a continual flow of moisture that rarely gets a chance to dry out. Examples of this are broken down pipes or leaking guttering, continual leaking from overflow pipes, roofing felt decay, dislodged roofing tiles or brickwork & pointing in poor condition. Penetrating damp can affect the timber in a property causing wet rot or dry rot to propagate. Damp patches on walls that don't dry out. Damp patches at high level. A distinctive sign of penetrating damp is when it's raining very heavily, the damp patches on walls get noticeably larger. To remedy penetrating damp issues it is first necessary to identify the source of water ingress, to prevent any further damage to the property. This could be something as simple as a blocked gutter or broken downpipe. 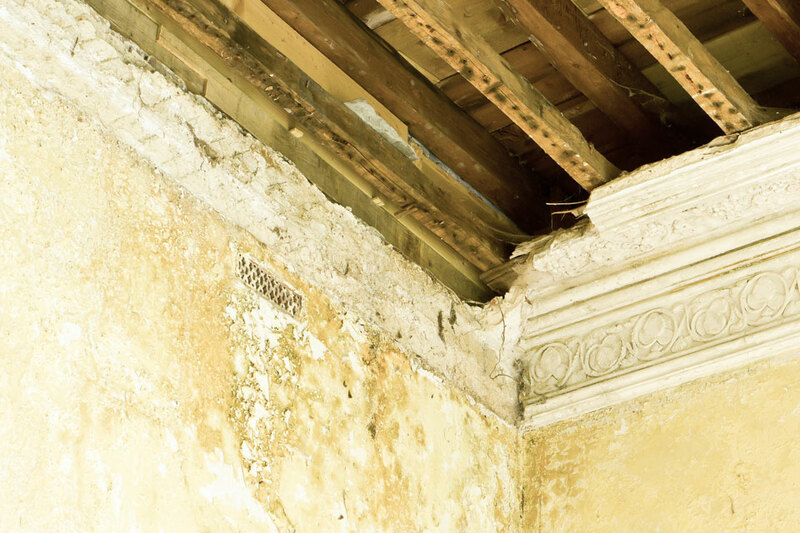 After that, any damaged plaster needs to be removed and an inspection of the area is required to assertain if wet rot or dry rot have occured, if so then the appropriate treatment needs to be carried out to remedy this. Also any damaged timbers will need to be treated or replaced. Damage caused by penetrating damp.